Duke Energy estimates it could spend $500 million on battery storage. Utility Duke Energy announced Wednesday that it plans to deploy $500 million worth of energy storage over the next 15 years. It’s worth unpacking what this means for the regulated utility, which covers most of North and South Carolina. A major vertically-integrated utility publicly committing to storage is still a novelty at this point, and $500 million is worth almost as much as the entire U.S. grid storage market for this year, based on Wood Mackenzie data. Upon further inspection, Duke’s $500 million plan does not refer to contracted procurements or any sort of binding commitment. Instead, it is a depiction of the battery storage installations predicted in the company’s latest 15-year plan. The number nevertheless says a lot about where the electricity industry is heading. And the utility could end up investing even more in this rapidly growing grid technology. Duke Energy spokesperson Randy Wheeless calculated the $500 million factoid based on the company’s long-range Integrated Resource Plan, which calls for a base case of approximately 300 megawatts of grid storage across both Carolinas by 2033. That includes the territories of Duke Energy Progress and Duke Energy Carolinas, which file their plans separately. The IRP itself doesn’t put dollar signs on its projected installations. “That was my doing,” Wheeless told GTM. He multiplied 300 megawatts by an average price for an installed battery system and arrived at $500 million. That data point should be read as more gestural than specific. The projects don’t exist yet, and they would be built over several years and geographic locations, meaning the actual cost of installation would vary from system to system. That said, it’s a savvy way to communicate Duke’s activities to the masses. Few outside the rarefied enclave of energy wonks grasp the significance of 300 megawatts, or could even imagine what that looks like. You can arrive at that capacity by adding up all of California’s commercial-scale and utility-scale batteries, but who can actually conjure that mental image? Now readers don’t have to. Half a billion dollars is more relatable. But that’s just based on the snapshot of the grid captured in the latest planning document. Energy storage means radically different things depending on where you are. In PJM, it’s a commonplace frequency regulation asset with a decade of run-time. In California, it’s an established local capacity tool that could soon take over for gas plants as a peak power source. In Arizona it’s a trusted mechanism for storing bountiful midday solar production, among other uses. Almost anywhere else, it’s the stuff of pilot projects, if it’s being considered seriously at all. Just next door to Duke, Dominion Energy said in its IRP this year that it “continues to monitor” battery storage, doing little more than affirming the technology’s existence. 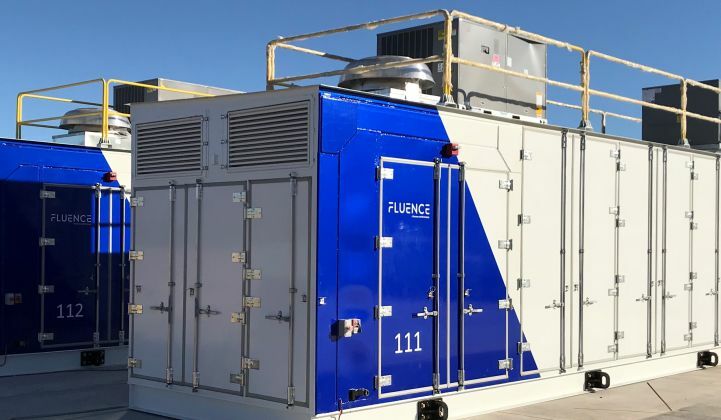 Duke Energy stands out as one of the few regulated utilities contemplating a robust role for storage on the grid without a legislative or regulatory mandate on the horizon. It’s already evaluating storage as a supply-side option alongside gas, nuclear and renewables. But, within the Carolinas, it has to operate within certain constraints. “In a regulated environment, you need to show the real value this has to all customers,” Wheeless noted. So the company started small. A map in the IRP shows seven operational battery systems in the Carolinas, all of them less than 1 megawatt. They were built as R&D projects, except for the 95 kilowatt-hour Mt. Sterling project. 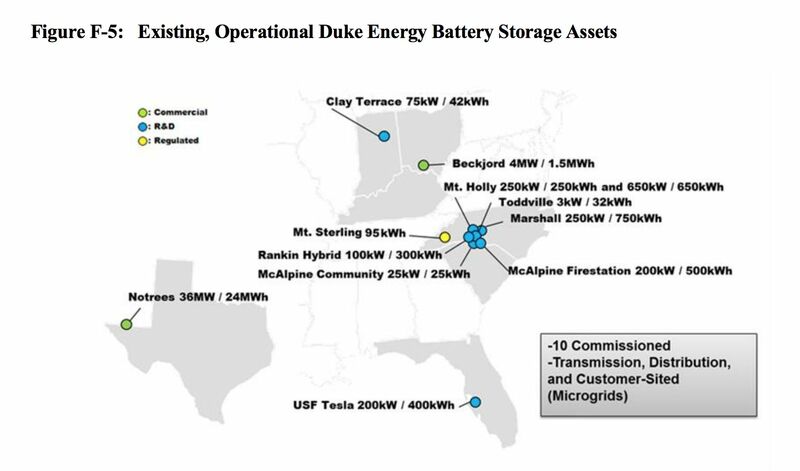 Duke has experimented with small-scale batteries within its regulated territory, and bigger ones outside (Image credit: Duke Energy). Duke got regulatory approval for that one because it saved ratepayers money compared to maintaining a single power line through miles of wilderness to an outpost in Great Smoky Mountains National Park. Duke used a helicopter to airlift the Fluidic Energy zinc-air battery, because the setting was so hard to reach (I covered that project for GTM Squared subscribers in 2017). This week, Duke filed for permission to build a 4-megawatt battery alongside 2 megawatts of solar in Hot Springs, a remote community of about 600 people; the battery will enhance grid reliability at lower expense than a conventional wires upgrade. In the long run, batteries could take on additional roles, like replacing peak power plants, Wheeless said. But to get there, the utility has to build a track record of installing them in ways that clearly save money for ratepayers. Doing so will give the company more experience with the necessary logistics, while expanding regulators' experience evaluating such efforts. “As you get a few in, the next few will be easier to get through on the regulatory path,” he said. The exact amount Duke will invest in energy storage is anybody’s guess. What we know for sure is how rapidly the utility’s expectations have increased. In last year’s IRP, the company predicted it would install 75 megawatts across the Carolinas within the planning period. In just a year, that number has quadrupled. And that’s before Duke has completed any megawatt-scale projects in that territory, which will provide better insight into the value of the technology. Digging deeper into the document, there’s already discussion of a heftier commitment. The base case scenario includes 140 megawatts of storage for Duke Energy Progress and 150 megawatts for Duke Energy Carolinas. One of the seven planning scenarios, however, assumes high renewable adoption and uses battery storage in place of a block of gas combustion turbines for fast-ramping power. That adds up to an additional 575 megawatts for each sister utility, totaling 1,440 megawatts across the Carolinas. Using the same cost conversion that Wheeless performed, this would yield $2.4 billion of energy storage investment. Again, the utility has not committed to that investment, it merely included it as one of seven planning scenarios based on the 2018 outlook for a rapidly changing industry. That said, the higher outlook for storage deployment rests on two entirely plausible contingencies. First, that renewables continue to accelerate in North Carolina, the largest solar market after California. South Carolina broke into the top 10 markets this year. Wind power there is only just getting started. Second, after trying its first substantial in-state battery projects, that Duke ascertains they offer a cheaper alternative to gas power in certain circumstances, factoring in battery price declines over the next decade. The experience of regulated utilities in California and Arizona suggests that success with smaller battery projects leads to comfort with bigger ones, culminating in batteries as a mainstream capacity resource. Duke Energy has taken the first steps down that path. Now in its fourth year, GTM's Energy Storage Summit will bring together utilities, financiers, regulators, technology innovators, and storage practitioners for two full days of data-intensive presentations, analyst-led panel sessions with industry leaders, and extensive, high-level networking. This year, we're expanding our traditional U.S. event to cover the global market. Learn more here.